Our ZooCrew middle school program aims to give students a first-hand look at how fun and rewarding a career in science can be. This semester’s students got hands-on experience exploring several different science careers, from zookeeping to conservation education to science writing. We are going to talk about a wolf pup’s life and what they have to go through in their life. So here we go. 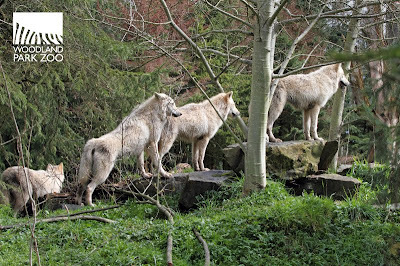 Wolf pack at Woodland Park Zoo. Photo by Dennis Dow/Woodland Park Zoo. 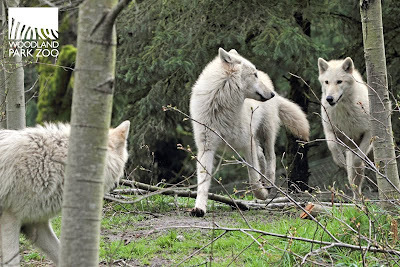 Wolves at play at Woodland Park Zoo. Photo by Dennis Dow/Woodland Park Zoo. As we move into position I'm thinking this is my first hunt, my first deer. There are a lot of firsts being a cub, a lot of learning, but you get used to it. As we run across the woods it feels like I'm flying. Then we find the deer, dad runs after it, and we all follow. Part of the pack goes around the brush to the left to Cordero the deer, I go with my dad to the other side. We spot the deer grazing in a nearby field and as we sneak up on the unsuspecting deer, dad goes in for the kill. Oh, the spoils of the hunt. As we carry back the deer I think the first hunt was a success, now I wonder how deer tastes. I do hope it tastes good. And that concludes our first blog post. Feel free to comment. Great job, ZooCrew! Good luck with your studies. Love the first person (wolf) perspective. Great job.